Member Andrew Nash’s website contains all the English title variations. The writings of Arne Saknussemm are translated by Professor Lidenbrock and with them he ascertains that they are directions that will lead him to the center of the Earth. -- Professor Arthur B. Evans of DePauw University, author of numerous articles on Verne and the award-winning Jules Verne Rediscovered (Greenwood, 1988). Translator & Critical Material: William Butcher. The World’s Classics. Oxford & NY: Oxford University Press, 1992. xxxviii+234 pages. Known internationally as a top-notch Vernian scholar, Butcher’s … translation, in particular, is a true pearl of a book: the translation is accurate yet smoothly readable, the 23-page introduction is insightful and reflected very up-to-date scholarship, and the 12+ pages of explanatory notes at the end (annotations keyed to certain terms, places, or people cited in the text) are extremely useful. Prior to Butcher’s (re)translation of this novel, the best one available was done by Robert Baldick (NY: Penguin Books, 1965). Both are very good translations, especially if compared to that hackneyed and maimed original English translation done in the mid-1870s and still reprinted today by many publishers (e.g., the Signet Classic paperback version which—perplexingly—is also published by Penguin). But between the Baldick and the Butcher translations, I personally prefer Butcher’s. His rendering of Verne’s stylistic idiosyncrasies is more faithful to the original, he follows more closely the original published format of Voyage au centre de la Terre (e.g., the absence of chapter titles, the mock footnotes, etc. ), and he retains the use of Axel’s present-tense first-person narration in the log-book portion of the text (when the three explorers are on the raft). Moreover, the additional reference material published in Butcher’s book—his introduction and notes, a select bibliography, a chronology of Verne’s life, and excerpts of Verne’s critical reception over the past 125 years or so—combine to make the OUP “World’s Classics” version the one to buy. -- Excerpted from Arthur B. Evans, “Superb Jules Verne Translations,” Science Fiction Studies, 22.2 #66 (July 1995): 288-89. Translator: Unknown. Dover, 1995. 160 pages. 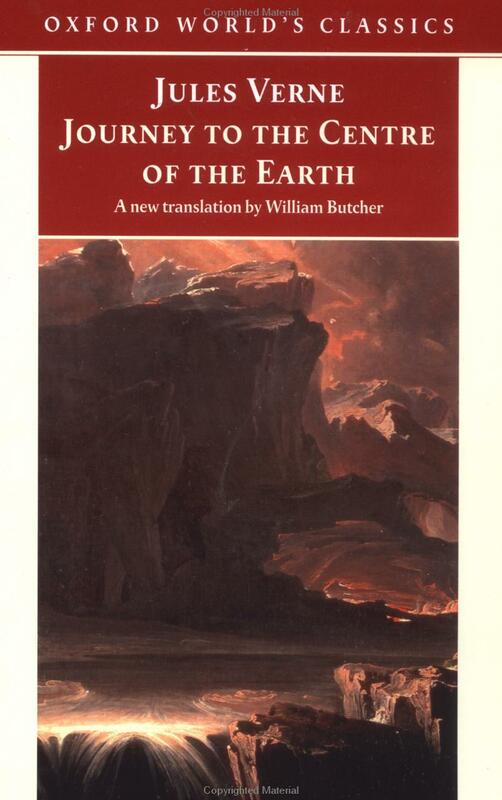 This Dover Thrift edition (1995) of “Journey to the Centre of the Earth” published by Routledge in 1876 is one of the three translations which are faithful to the Verne original. The usual translation refers to “Prof. von Hardwigg” and adds and changes much material. This translation refers to “Prof. Lidenbrock”, thus retaining Verne’s original nomenclature. Although an anonymous translation, it may have been made by Henry Frith who translated other Verne books for Routledge. A note of caution: Amazon lumps all versions of this title together in reviews, so be aware that this review applies only to the Dover Thrift Edition. -- Posted by Norm Wolcott on Amazon June 12, 2006. These accurate, entertaining translations are all available from Amazon: the 1876 Routledge (Dover, Modern Library, Bantam), Baldick (Penguin and Puffin), Butcher (OUP). To search for the latter two, spell the title’s middle substantive as “Centre”. -- Posted by Frederick Paul Walter to the Jules Verne Forum, 14 Jul 2008. See the review for this edition on this page.